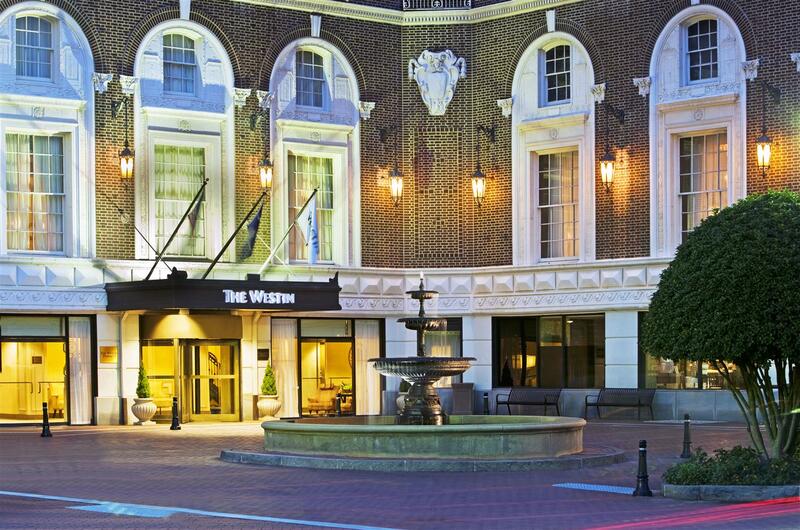 Experience the revitalizing luxury of The Westin Poinsett, Greenville, a AAA Four Diamond hotel. Located in the heart of downtown, we're one block from the Peace Center, which hosts concerts, shows and Presidential debates. Ask about our free shuttle to the airport, 14 miles away. Your exceptional stay in Greenville begins when you step into our sophisticated yet relaxing lobby where our staff stands ready to assist. Maximize your morning with breakfast at Spoonbread or, after a day in Greenville, relax with friends and colleagues over drinks and live music in the Lobby Lounge. Our WestinWORKOUT Fitness Studio, open seven days a week, includes Peloton bikes. With 10,000 square feet of bright, elegant event space, we're the perfect choice for weddings of up to 400. Wake up refreshed after a night in a Westin Heavenly Bed and prepare for the day in a bathroom with a marble vanity. All hotel rooms and suites feature our classic style and 24-hour room service. Stay balanced at The Westin Poinsett, Greenville. Spoonbread Restaurant: Join us for our morning buffet or la carte breakfast items at Spoonbread. Also open for lunch and dinner, this award-winning restaurant serves a variety of salads, sandwiches and other dishes and is popular with guests and locals alike. Lobby Lounge: Recharge after a long day in downtown Greenville at our classic piano bar. The Lobby Lounge serves up a refreshing selection of beers, wines and liquors along with a full menu of appetizers. Come for a drink and stay for the music. Joel's Java: Energize your morning with a cup of Seattle's Best coffee at Joel's Java before you head out for a day in Greenville, SC. Joel's serves a variety of fresh breakfast items, including cheese grits, fruit and granola parfaits.